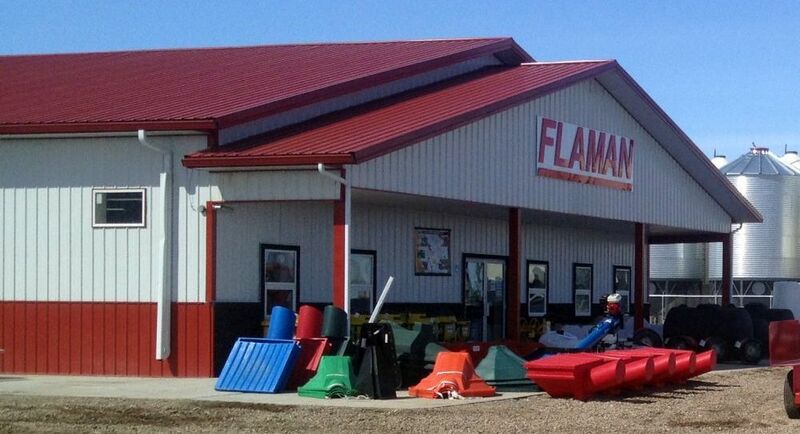 Flaman's new 10 acre location on the west side of Moosomin has over 90 trailers in stock, including flat deck trailers, enclosed cargo trailer, AirTow Level Load trailers, Ag transport trailers (including combine and sprayer), snowmobile trailer, dump trailer, utility trailers, construction trailers and much more. Flaman also has grain bins, augers, grain carts, water tanks and other related short line agriculture equipment. In December 2012 Moosomin opened a new 16,000 sq ft state of the art facility, including a rental drive-through bay and a fully stocked 7,000 sq ft showroom, as well as a large service shop, wash bay and trailer set up bay. With the expansion, Moosomin is able to service and set up all of its equipment inside the service shop. The rental drive-through bay allows customers to load and unload their rental equipment in a climate controlled bay, a big benefit during the winter months in Saskatchewan. Moosomin is now a full line store similar to any of the other nine corporate Flaman stores in western Canada. This new store carries a fully stocked show room of tow ropes, tow straps, trailer accessories, water pumps and over a dozen set up pieces of fitness equipment, along with all the related fitness products. Originally a rental store called Wayne's Rental Centre, the focus was the renting of construction, agriculture and home owner equipment, Since April 2011 when Flaman purchased the existing business, the emphasis has been on expanding the retail side of the business. We've come a long way since being just a rental store.